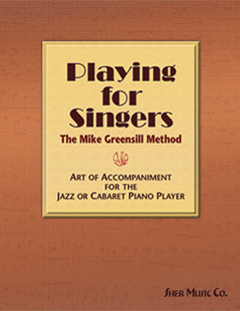 Playing for Singers by Mike Greensill | Sher Music Co. Playing for Singers explores, in depth, the art of accompaniment for the jazz or cabaret pianist. Covers all the fundamentals of playing for vocalists. A comprehensive resource for everyone — from the beginning jazz pianist, to the crusty old pro needing a tune-up for his/her next accompanying gig! How to accompany singers as a solo pianist. Duo and Trio accompaniment - What happens when we add bass and drums? The accompanist as arranger/composer, including the skills needed to put together readable, good looking charts. The accompanist as music director - A survey of all the myriad duties of a musical director, from conducting the band, to running rehearsals, to helping write and organize vocalist's shows. 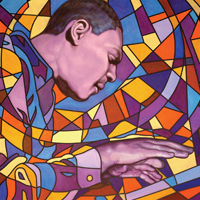 Nuggets of wisdom from the great accompanists - accompaniment philosophies and tricks of the trade from Norman Simmons, Jimmy Rowles, Bill Charlap, Christian Jacob, Tedd Firth, Sir Richard Rodney Bennett, and more. A useful book for singers, as well as pianists, since it sheds much light on the intimate relationship between the two! 121 pages, including numerous musical examples.